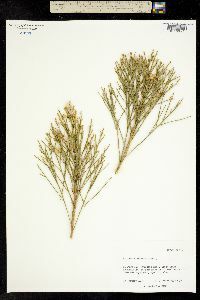 Shrubs, 100-450 cm (not broom-like). Stems (sometimes in clumps) erect, striate-angled, glabrous, eglandular. Leaves present at flowering; sessile; blades (1-nerved, lateral veins obscure) narrowly elliptic to linear, 30-80 × 1-2(-5) mm (moderately thick), bases narrowly attenuate, margins entire or serrate with 2-3 small teeth, apices acute, faces glabrous, gland-dotted (distal reduced, entire). Heads (axillary and terminal on lateral branches) in pyramidal, paniculiform arrays. Involucres cylindro-campanulate; staminate 3.5-4 mm, pistillate 4-5 mm. Phyllaries ovate to lanceolate, 1-3 mm, margins yellowish, often scarious, medians green or reddish, apices acute to acuminate (often purplish, sometimes erose). Staminate florets 10-15; corollas 2.7-3.3 mm. Pistillate florets 15-30; corollas 2.5-3.3 mm. Cypselae 1-1.5 mm, 10-nerved, glabrous; pappi 7-12 mm. Flowering Aug-Nov. Disturbed habitats, old fields, pastures, roadsides, streambeds; 200-600 m; Tex. ; Mexico (Chihuahua, Coahuila, Nuevo León, San Luis Potosí, Tamaulipas). As circumscribed here, Baccharis neglecta is known north of Mexico only from central Texas, mostly on the Edwards Plateau. 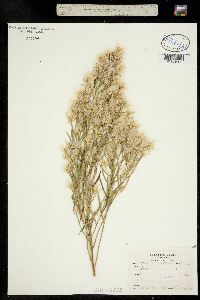 It is recognized by its tall and erect habit, very narrow leaves with small shallow teeth, pyramidal arrays, and 10-ribbed cypselae. 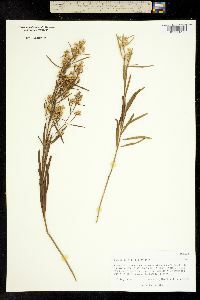 It is most similar to B. salicina and may represent a xeromorphic, narrow-leaf form or variety of that species. Baccharis neglecta invades rangelands and pastures, forming dense stands. It is an especially aggressive invader of land converted from crops to pasture and it is a prolific seed producer; it readily resprouts when burned or cut.